With long delays due to sporadic routing links in cognitive vehicular communications systems, relay node selection is one of the key design factors, as it significantly improves end-to-end delay, thereby improving overall network performance. To this end, we propose infrastructure-aided hybrid routing that uses a roadside unit (RSU) to help vehicular nodes to select idle channels and relay nodes. Channel selection is done with a belief propagation algorithm, which aggregates individual beliefs with the help of vehicles and RSUs to make a final belief, providing high accuracy in hypotheses about spectrum availability. The selection of a relay node is determined by calculating the message delivery time—the source/relay node selects the one that has the minimum message delivery time from among all the neighboring nodes. This is a hybrid (vehicle-to-vehicle and vehicle-to-RSU) communications scheme where two nodes can communicate only when they have consensus about a common idle channel. The idea is to combine cognitive capabilities with a routing technique in order to simultaneously overcome spectrum scarcity and network connectivity issues. Therefore, both dense and sparse network conditions are considered in this routing protocol for both highway and city scenarios. To enhance the stability of cognitive routing links, different functions for vehicles and RSUs are considered. We prove better performance in delay, delivery ratio, and overhead by comparing the proposed technique with two existing techniques (one dealing with, and another without, RSUs). This work was supported by the National Research Foundation (NRF) of Korea funded by the MEST (NRF-2016K2A9A1A01950711). Lee, K. C., Lee, U., & Gerla, M. (2009). Survey of routing protocols in vehicular ad hoc networks. 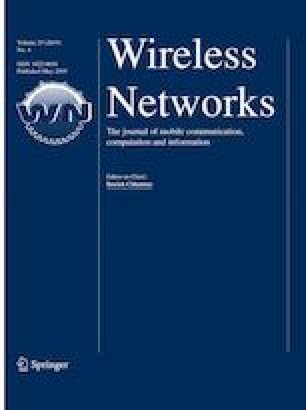 In Advances in vehicular ad-hoc networks: Developments and challenges (Chap. 8, pp. 149–170). IGI Global. https://doi.org/10.4018/978-1-61520-913-2.ch008. Zhang, N., & Mark, J. W. (2014). Cooperative cognitive radio networking. In Security-aware cooperation in cognitive radio networks (Chap. 2, pp. 15–22). SpringerBriefs in Computer Science. https://doi.org/10.1007/978-1-4939-0413-6_2. Bukhari, S. H. R., Siraj, S., & Rehmani, M. H. (2016). NS-2 based simulation framework for cognitive radio sensor networks. Wireless Networks. https://doi.org/10.1007/s11276-016-1418-5.